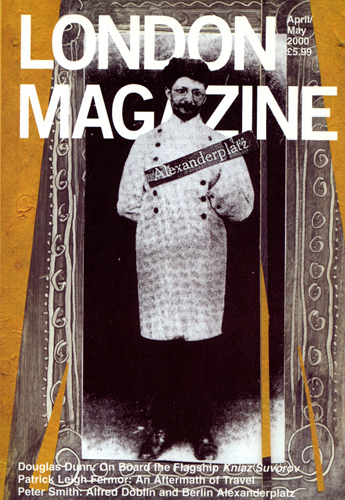 Berlin Alexanderplatz (1929) is Alfred Döblin’s most famous novel and a key work in the modernist canon alongside Joyce’s Ulysses and Dos Passos’s Manhattan Transfer. The setting is Berlin in the Golden Twenties. But there is little glamour in the life of Döblin’s ordinary hero, Franz Biberkopf, a one-time cement worker and furniture mover, who at the beginning of the novel has just been released from Tegel prison where he has been serving time for the murder of his girlfriend. The novel echoes with the lost sights and sounds of Berlin: faces glimpsed amongst the crowds, snatches of conversation, phrases from songs and advertising hoardings, newspaper headlines, the rattle of trams in Berlin’s streets, the rhythmic thud of the steam pile-driver in front of Aschinger’s bar on Rosenthaler Strasse (‘rumm, rumm’), and the squealing of dying animals in Berlin’s new slaughterhouse. Alexanderplatz — the main square in north-east Berlin and the focus of working-class life in this over-crowded city. It was a meeting place for ordinary people, just as the fashionable Kurfürstendamm was for flâneurs and intellectuals. As well as a social forum it was also a commercial locus, both for legal and criminal transactions: the haunt of newspaper vendors (in 1927 there were as many as 18 daily newspapers in Berlin), diverse hawkers, black market traders and less pricey prostitutes than on the Ku’damm. 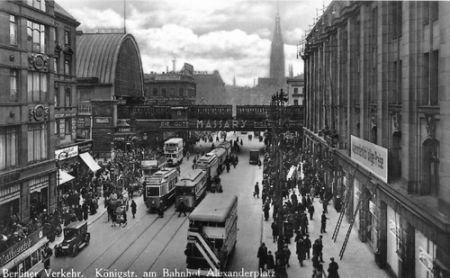 Alexanderplatz is the stage on which Franz Biberkopf’s life is acted out. At first he is afraid, traumatised by prison and overwhelmed by the bustle and noise of Berlin; he sings songs from the trenches to ward off the terror of freedom. A Jewish man helps him by telling a story and the fear passes. Soon he can face the metropolis again. He swears to himself that this time he is going to stay out of trouble, and give the blue-uniformed Schupos (coppers) a wide berth. Around him Berlin throbs and shudders to the rhythm of the trams and the pile-driver like some vast and wonderfully complex organism. It is as vibrant and alive as Franz Biberkopf himself — perhaps even more so. Döblin’s novel depicts Berlin as a physical system that obeys the laws of nature. Franz is an inseparable part of the material processes of this teeming metropolis: his life is a microcosmic reflection of Berlin. Like all physical systems, animate or inanimate, Berlin is a place governed by laws. Of course, Franz Biberkopf knows all about laws: he has fallen foul of the law once already and before the book is finished he will feel the long arm of the law again. Indeed, the head quarters of the Berlin police, known by those who had reason to avoid it as ‘der Alex’, was located on Alexanderplatz. It was within sight of the area’s infamous bars to which Franz is inexorably drawn (‘Booze, booze, guzzle and booze, Leave all your troubles at home…’), where Berlin’s underworld held court in rooms thick with tobacco smoke. But there is also another order of lawfulness that Franz Biberkopf experiences: the laws of nature. These are the laws that science struggles to decipher, just as the passengers on the Line 12 puzzle over their long tram tickets: ‘mysterious runes, who can solve them? Who can guess and who confess them? Riddle-me-riddle-me-ree’. Lawfulness, whether it is part of the criminal code, science or the Bible, infuses every aspect of Berlin life. Then the fat fellow goes out, puffing and blowing, and he loosens his belt behind a bit, to give his belly enough room. He has got a good three pounds stowed away, all victuals. Now things get started in his belly, begins to labour, now his belly has to set itself to deal with what that lout has thrown into it. His bowels shake and wobble, winding, twisting like earthworms, the glands do what they can, they squirt their juice into all that stuff, squirt away like firemen, saliva flows down from above, the fellow swallows, it flows down into his bowels, there is an assault on the kidneys, just as in big shops when the sales are on, and gently, gently, lo and behold, little drops begin to fall into the bladder, one little drop after the other. Just wait, my boy, wait, soon you will be back, retrace your steps to the door marked ‘Gentlemen,’ and that’s the way the world wags. Like a starving animal he has devoured the ‘steaming plate of roulade of beef, gravy, and potatoes’. Now the laws of human biology take over as the digestive enzymes convert the foodstuffs into chemical forms that can be absorbed by the body. At this moment the ‘young gentleman’ is no different from any other law-abiding organism that needs a source of energy to fuel its metabolism. And of course it is no coincidence that this takes place within the building of the Labour Court: the laws of biology and the state are equally active in Döblin’s Berlin. This account shows how these different laws mesh together like cogs in the monstrous machines tended by Chaplin in Modern Times. The x-ray vision of Döblin’s narrator enables us to see the young gentleman’s stomach as a microcosm of the lawful city. The boy, Max Rüst, will later on become a tin-smith, father of seven more Rüsts, he will go to work for the firm of Hallis & Co., Plumbing and Roofing, in Grünau. At the age of 52 he will win a quarter of a prize in the Prussian Class Lottery, then he will retire from business and die during an adjustment suit which he has started against the firm of Hallis & Co., at the age of 55. His obituary will read as follows: On September 2, suddenly, from heart-disease, my beloved husband, our dear father, son, brother, brother-in-law, and uncle, Paul Rüst, in his 55th year. This announcement is made with deep grief on behalf of his sorrowing family by Marie Rüst. In this passage the narrator demonstrates a godlike omniscience. Francis Bacon, one of the founding fathers of modern science, believed that knowledge of the laws of nature is the route to power over nature. The more complete the scientist’s knowledge of those laws is, the more accurate will be his predictions and the greater his power. This was the dream of the mathematician Pierre Laplace in the early nineteenth century and one shared by scientists ever since: to reach such a thorough understanding of the lawfulness of the universe that all future states of matter can be predicted. Of course, twentieth-century physics has revealed a new order of complexity to matter that has shaken the assumptions of Laplace’s mechanistic determinism. Yet Döblin’s twentieth-century narrator is so certain of his understanding of the laws affecting human existence that he can foretell the life even of this cameo character. Does this mean that Berlin Alexanderplatz is the expression of the materialist and determinist ideology that has fascinated German intellectuals since the middle of the nineteenth century? Determinism is clearly a powerful theme in the novel and one supported by the scientific narrator. But this is not the whole story. For although Döblin allows the reader to be guided by the scientific discourse of his narrator, ultimately the psychological transformation that allows Franz to escape death takes place on a level beyond that kind of scientific understanding. In an article published on the occasion of his sixtieth birthday, Alfred Döblin (1878-1957) characterised his youth by quoting Goethe’s Faust: ‘at about twenty I wanted to be a philosopher and to know “the inmost force that bonds the very universe”. And at the same time I studied medicine.’ His doctoral dissertation in the field of psychiatry was accepted in 1905. After this Döblin spent three years learning clinical psychiatry in mental asylums before becoming an internist at the Charité Hospital in Berlin, where the medic and poet Gottfried Benn also worked for a brief and unhappy period. Between 1909 and 1913 Döblin published no fewer than sixteen research articles on psychiatry. However, his initial enthusiasm for research was tempered by a profound scepticism regarding our ability to ever fully understand the complexity of human psychology. This scepticism was wide-spread amongst clinical psychiatrists at the beginning of the twentieth century. It was felt that as so little was understood about brain function and its relation to mental processes, psychiatry should limit itself to the observation and description of the symptoms of mental illness. His doctoral supervisor, Alfred Erich Hoche, endorsed this approach, but it was a view with which Döblin became disillusioned in later life, as Berlin Alexanderplatz shows. In 1913 Döblin published an essay entitled ‘Berlin Program: For Novelists and their Critics’. In this he proposed a theory of literature based on psychiatry and modestly christened it ‘Döblinism’. He was harsh in his criticism of authors who indulged in amateur psychology. As in his scientific work, such as the psychiatric case histories he wrote as a clinician, Döblin insisted on the precise description of events and symptoms. Furthermore, the author should remain neutral, a distanced spectator of events. The author’s role as narrator, as someone who explains events, was to be made redundant and the character’s experience allowed to speak for itself. Döblin hoped to inaugurate a new naturalism in literature, a ‘fantasy of facts’, in which language was pared down to its essentials. This contrasts with the nineteenth-century model where the narrator is in a position of omniscience, supplying background information, such as details of the character’s early life, in order to explain behaviour and events. Instead, in Döblin’s early stories we are drawn directly into the strangeness of human consciousness. The reader is placed in the position of the psychiatrist faced with the complexity and uniqueness of the individual patient. Döblin’s new naturalism was meant to sweep away the dilettantish psychologising of nineteenth-century writers. He called for a style modelled on cinematic techniques. The use of montage in Berlin Alexanderplatz is in part the result of this demand. The sensual texture of everyday life is invoked to create a filmic bricolage of Berlin in the period 1927-28. Yet despite the earlier theoretical commitment to an unobtrusive narrator, there is a strong narrative voice in Berlin Alexanderplatz. In this it differs from both his early evocation of psychosis, The Murder of a Buttercup (1910), and his major dystopian novel Mountains, Oceans and Giants (1922-4). The narrator questions and berates Franz from the beginning of the book: ‘Franz, you mustn’t hide yourself. Four years you’ve been hidden, courage, look around, this hiding has to come to an end some time.’ The tone is not compassionate but impatient: the voice, perhaps, of a doctor (Döblin the clinical psychiatrist?) who has become tired of dealing with a particularly obdurate patient. Ironically it is the use of this scientific voice that is at odds with Döblin’s own scientifically inspired literary theory in which he announced the death of the author-narrator. For in Berlin Alexanderplatz the scientist as narrator enters modernist literature, and moves, as we shall see, into territory beyond the reach of empirical description. In the depiction of Franz Biberkopf’s assault on his girlfriend Ida the narrator uses the laws of physics, specifically Newton’s laws of motion, to explain the mechanics of the incident. The narrator takes evident pleasure in citing the relevant mathematical equations that for most readers must seem as arcane and even irrelevant as the passage detailing the granting of hunting rights to a certain Herr Bottich in the area of the Faule Seepark on specified dates. But clearly these formulae are not irrelevant, for the voice of science is central to this text in a way that Herr Bottich’s hunting rights are not. Throughout the chapter that discusses Ida’s fatal injuries, however, the voice of science is juxtaposed with the voice of myth — Aeschylus’s Orestia. Franz Biberkopf’s fate is contrasted with that of Orestes who killed his mother to avenge her murder of his father, Agamemnon. Is Franz Biberkopf hounded by the Furies for what he has done, as was Orestes? No, he is not greatly troubled by his responsibility for the death of Ida: ‘Thus our furniture-mover, newsvendor, etc., Franz Biberkopf, of Berlin N.E., differs from the famous old Orestes in the end of 1927. Who would not rather be in whose skin?’ Description of Franz’s assault on Ida (explained by scientific formulae) alternates with invocations of the Greek tragedy. The lighting of the beacons to announce the impending arrival of Agamemnon is contrasted with its modern equivalent: wireless, made possible by the discovery of electric waves by Heinrich Hertz (although a keen radio builder, Döblin spares us the equations this time). As regards wireless, the narrator comments ironically: ‘It’s hard to get enthusiastic about all this; it functions, and that’s all.’ In this respect the modern age, for all its technological advances, is shown to be deficient: ‘Here again we’re inferior.’ Clearly, at a symbolic level the legends of ancient Greece have an explanatory power that is superior to scientific knowledge. The Greek legends contain a different order of truth from the statements of science. And yet apparently this truth has no place in the materialist world which Franz Biberkopf inhabits: it is science that the narrator trusts to describe what happens to Ida, not Aeschylus. The effect of these two very different voices jostling for attention is to modify the authority of science. Having cited the first two of Newton’s three laws of motion to describe the effect of Franz’s blows, the narrator states that these equations enable one to calculate precisely ‘what Franz did and what Ida suffered. There is no unknown quantity in the equation.’ Despite the narrator’s claim here, his words cannot be read as a final, authoritative statement for the voice of the Greek legends demands to be heard in the very next paragraph. The mechanistic laws of Newtonian physics may be wholly adequate to describe the motion of solid bodies, yet the story of Franz Biberkopf is about so much more than this and it is clear that we do not understand ‘what Franz did and what Ida suffered’ by equations alone. Neither Ida’s suffering nor Franz’s behaviour can be reduced to quantifiable data expressed in mathematical formulae. Similarly, in Berlin Alexanderplatz it is scientific law as the immanent fate of the modern world that the narrator invokes through the character of Franz Biberkopf. Laws — historical, economic, biological — determine his behaviour and his fate. But there is one element that resists inclusion amongst the forces of this modern fate. The psychological causality which governs Franz Biberkopf’s mind eludes description in these terms. It remains the ‘unknown quantity’ that offers individuals the potential to rise above the law-governed materiality of their lives and to take control of their destiny. In myths and stories we examine, test and celebrate this psychological complexity. This is why the voice of the Greek legends speaks with such undoubted power in Berlin Alexanderplatz despite the claims of science to describe our world. The psychiatrists play no role in this psychological metamorphosis. They do not even see Franz’s suffering as he is tormented by the vision of Death. If he opens his mouth they believe he is thirsty. Their expertise extends little beyond the observation of physical symptoms. They take his pulse and lift his lids to peer into his sightless eyes; but Franz’s vision is in his mind’s eye, beyond the reach of science. They do not hear him when he says: ‘I’m suffering, I’m suffering.’ Just as the scientific narrator’s use of Newtonian equations cannot explain the suffering of Ida, so here mechanistic science is unable to understand the complexity of human consciousness. In his description of Franz’s transformation into a ‘new person’, the narrator of Berlin Alexanderplatz is forced to accept the limitations to his own scientific understanding. Something extraordinary happens in the mind of Franz Biberkopf, this very ordinary citizen of Berlin. Predictable and determined though the external events of his life may be (like Max Rüst’s life), the narrator cannot explain his final transformation without invoking mythological and metaphorical language. Factual, scientific language of the kind demanded in the ‘Berlin Programme’ is inadequate here. The descriptions of Death personified and the use of Biblical motifs and Greek legends represent the points at which empirical description breaks down in the attempt to describe a higher level of being. The scientific register of the narrator’s account is not made redundant but supplemented by an older and more holistic vocabulary that highlights the fundamental complexity of human psychology. It is this ability to allow the voices of science and myth to exist together in an uneasy and ultimately creative proximity that is the measure of Döblin’s literary achievement. For he creates a narrative prose that combines the facticity and authenticity of a scientific case history with the symbolic truth of myth. At the age of sixty Döblin commented that he disapproved of contemporary medicine: ‘Why? It is not based on a world-view with which I agree. To me it seems lucid and clear, but not profound enough.’ Although a medical practitioner for much of his life, Döblin’s interests took him beyond the mechanics of the body to more open fields: to a holistic world-view that tried to locate the individual within the animal, vegetable and mineral orders of nature. This development in Döblin’s ideas is reflected in the contrast between his early work and Berlin Alexanderplatz. It is a movement away from the positivist and sceptical attitudes of the young psychiatric researcher towards a more complex account of reality, one which includes speculative ideas as well as empirical scientific evidence. And it was through the medium of literature that Döblin sought to express this view, creating a unique fusion of science and literature.